The Coventry Taekwondo Club was founded in 1974 by Mr. R Haines & Murray Walker. 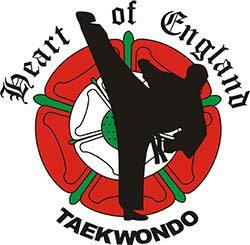 When the club expanded outside Coventry it was renamed The Heart of England Taekwondo Club in 1982 by Master N. Guest and Mr. S Guest. The Heart of England Taekwondo Club is continually building a reputation for excellence locally, nationally and internationally. Senior Instructor Master Neil Guest, a 7th Dan with over 40 years experience in Martial Arts, has earned a considerable standing in Taekwondo that only a few can match. He now coaches either directly, or through our team of experienced Masters and Dan Grade Instructors. We are one of the only clubs in the UK that has four Masters (one 7th Dan and two 6th Dans and one 5th Dan) among its members and is proud of every one of the 300 plus members throughout the ‘Heart of England Club’ at classes spread throughout the Midlands. Following the success of the London Olympics we are currently getting many people from outside the World Taekwondo (WT) enquiring and joining us. WT is the only path to the Olympics so there is no better time for students/instructors to make the transfer. Some Taekwondo groups outside of the WT are very proud of the fact that they stick to traditional Taekwondo that was taught in the early days of Taekwondo. We have people joining us from these groups all the time and it is through these people joining us, that we know these outside groups are still practicing exactly the same way we did 30 years ago. This is all very nice but people fight totally different today than how they did 30 years ago, all combat needs to evolve and move with the times. WT rules don’t allow punching to the head in competition but this has been misinterpreted by some people, saying we don’t teach punching to the head at all and how to defend against it in class. Which is not true. In our 1 step we punch to the head (without contact of course). In Free sparring we also allow punching to the head and teach how to defend against it. Punching to the head was not allowed in WT competition to simply gain access into the Olympic Games. ITF, Kung Fu, Karate, kickboxing all had similar rules in competition so it was difficult to choose one of these over the other. So not allowing punching to the head made WT unique, it was like boxing with the feet, hence the reason why it was picked by the International Olympic Committee IOC as an Olympic sport. The Olympics is how Taekwondo has been seen by the world, although it only reflects a small part of Taekwondo. WT Taekwondo is a martial art but some Taekwondo groups outside of the WT will say they do the Martial Art and we (WT) concentrate on the sport. Again not true, we do everything these groups do, and more. Because of the Olympics every country is out to beat every other country. We in the UK spend thousands of pounds in scientifically improving WT Taekwondo techniques, to be faster more powerful and more effective and this gets filtered down to us, its members first. WT has progressed, and through government funding offers so many opportunities for everyone not just the kids but for everyone. I know transferring can be quite a daunting thought but I myself transferred to the WT 31 years ago after training in ITF style for 7 years. So I am very aware of the differences of the two styles and can work with you on making the move over as easy as possible. I have spent 38 years of my life training in Taekwondo and I have never been happier than I am at present with my Taekwondo. As an instructor it is my aim to make as many students of mine better at Taekwondo than me. I believe I have already achieved this with several of my students but this was the main reason I moved to the WT because it is continually developing and improving, not only on the Olympic side but as a martial art and self defence system. As an Instructor being part of the National Governing body is important to me. It is the best place to be when developing youngsters in the art. The youngsters get better financial support and a chance of developing their skills into elite players which could lead to Olympic glory. These are exciting times if you want the best for yourself or students then please contact me and we can have chat about the available options.